I received this letter in the mail from Chris and Sarah, founders of Say Hay Farms. Although it is difficult and emotional to see small farms who exemplify strong ethics go under, it is even more the reason to support local when possible, learn how to grow and cultivate your own produce, or just plain incorporate more produce into your diet, for starters. What is important is that first step you take. Maybe it won’t land you to ‘Instagram’ worthy level, but it will get you somewhere. And then from there, you can navigate your way onward and upward, one step at a time. We at A Healthy Shelf were so happy we had the opportunity to experience Say Hay Farms’ spin on CSA! It was personal, it was informative, and it was fun. We wish Say Hay Farms all the positive vibes as they move into their next phase, and we will keep an eye out for their retail eggs and produce at stores around the area! It’s hard to believe that I embarked on my first Northern California produce box service eight weeks ago. I have been trying out different produce delivery services in the Bay Area and will provide a ranking after I have completed my tenth. I must say that this week I found it difficult to decide on which service to select, mainly because several of the farms I was interested in had fulfilled their CSA subscription commitment for the year and therefore were not accepting any new customers. I came across Say Hay Farms via the Good Eggs website. Good Eggs is an online grocery platform that sells a variety of fresh produce and healthy packaged food. The site also distributes a few CSAs, include the one from Say Hay. Say Hay Farms is a first generation family owned farm founded by Chris Hay and his mother Sarah Hay in 2010. The Hay family started off with 2.5 acres and now grow produce and raise hens across 45 acres of land located in Esparto, Yolo County, California. They grow seasonal produce harvested from sustainable farming practices, and raise hens that produce eggs filled with nutrition and flavor, achieved through proper feeding and breeding techniques. Before I completed the order for my Say Hay Farms review, I took some time browsing their website which was full of information.The farm has implemented a farming technique that uses the same land on which to raise their chickens and grow their vegetables. Animal manures are used to fertilize the crops (which limits the need for fertilizers and pesticides) and crop residues and pests are used as animal feed (which provides the best feed sources possible). Say Hay Farms focuses on their produce with a huge emphasis on their egg production: how they care for the hens, what they feed them, and more. Say Hay debunked some common myths on eggs as well. For example, the color of the egg shell has nothing to do with nutrition; it is just based on the breed of the hen. Say Hay Farms listed many reasons why choosing local and supporting neighborhood farms is so crucial in addressing the environmental challenges that lay ahead for us as we continue to develop and navigate our ever-evolving planet earth. Also, there was a list of places that incorporate products from the farm, including farmer’s markets, retailers, and restaurants in the area. I clicked on the CSA tab, created an account, and started to build my order for my Say Hay Farms review. The check out process was simple and straight forward. No option to personalize my box, however the website lists the produce grown on the farm in both the Summer/Fall and Winter/Spring seasons. I knew the types of produce that would potentially end up in my produce box. The list was concise yet diverse. Pick ups and deliveries were available throughout the Sacramento Valley and Bay Area. Say Hay CSA boxes are also available using the Good Eggs online grocery platform. I opted for a local pick up. An electronic newsletter was sent out the day before pick up that listed the exact produce that would make up the weekly CSA box. There were also a few recipes and preparation tips for me to peruse. I opened up the wax box that contained the produce from my Say Hay Farms review, excited to see what this smaller farm would deliver. I noticed a variety of colors that ranged from reds to oranges, yellows to greens. I also received a note from the farm listing a few tips on their CSA process and welcoming me to the program. Here is a list of items I received as part of my Say Hay Farms review! Carrots: a nice looking bunch of fresh carrots with their greens still attached. Beets: three huge beets that the farm suggests I turn into chips. Perhaps I just may follow suit. Chard: very large leaves with thick, red stems. Summer Squash: three in total - one in the shape of a zucchini you’d find at the store, the other two looked like small balls (perfectly round)! Batavian Lettuce: a large head of lettuce that ombre-ed in hue from green to deep purple shades. Spring Onions: small, white heads of onion with long, green stems sprouting out of the root. I had thought about pickling vegetables for months now, so upon a quick Google search of: what to do with chard, I came across a pickled stem recipe. I had all of the ingredients in my pantry, so I decided to give it a shot. I used rice vinegar which was a bit strong, mixed with water, sugar, salt, and red pepper flakes. I sealed them in a mason jar and stored the jar in my fridge. Boy, they are strong with a kick from the red pepper flakes. I enjoyed them - they had a different flavor profile than any other dish I had ever made. They will be a nice accompaniment to a salad or sandwich in the future, as they should stay for a week or two kept in the fridge. I have never been great at making vegetable chips in the oven, but I decided to follow the recipe provided for me in my Say Hay Farms review box. I sliced two beets about 1/16 of an inch thin, tossed them in oil, and popped them on to a baking sheet and into the oven at 350 degrees. Say Hay’s recipe hack told me to place an empty baking sheet on the rack above, so as to block a bit of the direct heat (at least that is what I assumed the reasoning to be). I burned a few of the chips, but salvaged the rest. The sweet flavor of the chips was incredible, but not quite the crunch I was searching for. I am glad I gave it a try though and next time will do better! I knew I wanted to savor the shapes of those summer squashes, so stuffing them seemed like the most obvious choice. I went with it. I sliced off the very tops of the squashes and scooped out their innards, creating hallowed out squash shells. I then sautéed bell peppers, fresh garlic, squash, and rice, along with some paprika and cumin. With a preheat of 400 degrees, I stuffed the squashes with the rice-veggie mixture and set it in the oven to bake until the squash was soft, about 40 minutes. I always enjoy a hearty soup that contains a variety of random vegetables. I used the spring onions and carrots from my Say Hay Farms review mixed with some celery as the mirepoix base. After they became soft in the pot, I added cabbage and potatoes that were also locally sourced. It is truly incredible to taste the difference, uniqueness, and depth of flavor when you work with local produce; there is seriously no comparison in taste, and I know that this goes hand in hand with nutritional content. I added some turmeric, cumin, salt and pepper to the broth and let that soup simmer away. The cabbage made the entire soup exceptionally sweet, as a vegetable has a tendency to do once cooked down a bit. The soup was hearty and provided comfort. I enjoyed my Say Hay Farms review box. Although not a huge amount, I appreciated the beautiful local food from this small farm. Plus it was a very good value for $22. The produce included items of all different colors, shapes, and sizes. The summer squashes were absolutely fantastic in every way, with sweet insides and a very cute shape that I do not normally see in the stores. 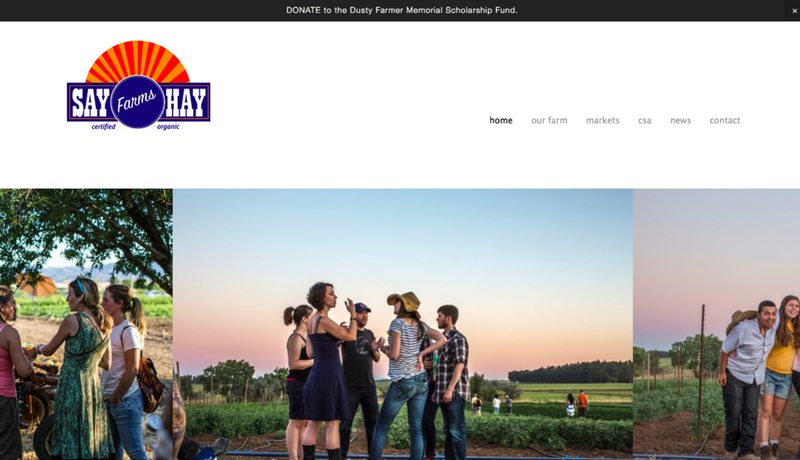 I spent a considerable amount of time on the Say Hay Farms website. Their story was very captivating. I enjoyed learning more about their farming practices and their commitment to helping future farmers further their careers. Due to the fact this is a small farm, expect a little less variety in this produce box than some of the others. Check out my full ranking page of all 10 delivery services here!